As ever, a nice selection of photos has come my way from generous photographers happy to share their work with us. Here are a few photos of recent bird activity around South Jersey - there's just so much going on in the spring here!! Where there's birds there's action; add a camera and you have some great photo opportunities if you sit, wait, watch and keep fingers crossed. A young Herring Gull chasing a Glossy Ibis to relieve it of its lunch was fine reward for this photographer [photo by Lambert Orkis]. Since birds don't read books, it's not that unusual to find one that doesn't seem to be immediately recognizable. The amount of reddish coloration in male Yellow Warblers varies from one subspecies to another, but occasionally, an individual may buck the trend. This bird is likely to be an individual of the yellow-headed form normally found throughout the eastern USA, but it has a fairly extensive red wash to the head which vaguely resembles the appearance of the red-headed individuals found in the tropics (and often called Mangrove Warbler. Over long periods of time, such genetic variation in individuals is one of the ways that new subspecies evolve and - eventually - even new species [photo by Marvin Hyett]. A fine set of whiskers! This Great Egret looks as though it is sporting a spectacular mustache - but look again... This bird has caught an unfortunate Semipalmated Sandpiper and clearly demonstrates that herons and egrets will take on anything so long as they can grab hold of it [photo by Richard Zielinski]. 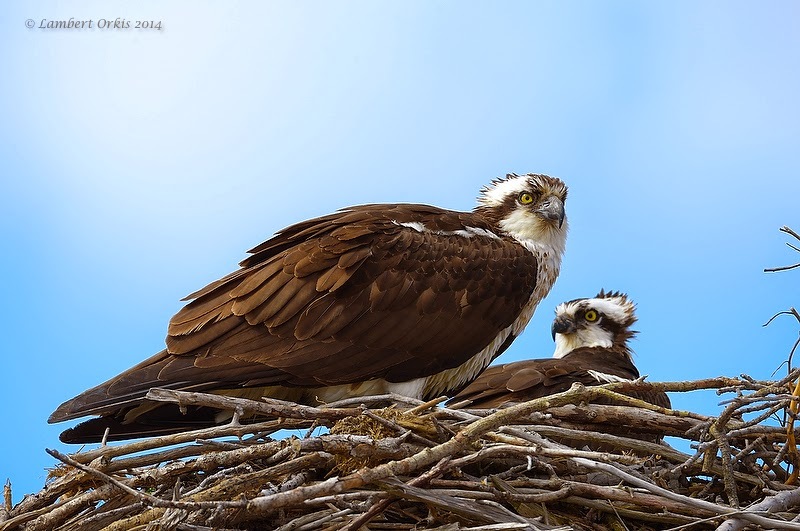 Ospreys are one of the iconic birds of the Delaware Bayshore and no visit to the backbays or beaches of Cape May is complete without burning up a few hundred megabites or more of digital data on these fine birds [photo by Lambert Orkis]. As we transition into summer, the babefest has began on Cape May's sandy beaches. These young American Oystercatchers are currently calling the South Cape May Beach their home and have been brightening up a number of our walks this past week [photo by Warren Cairo]. 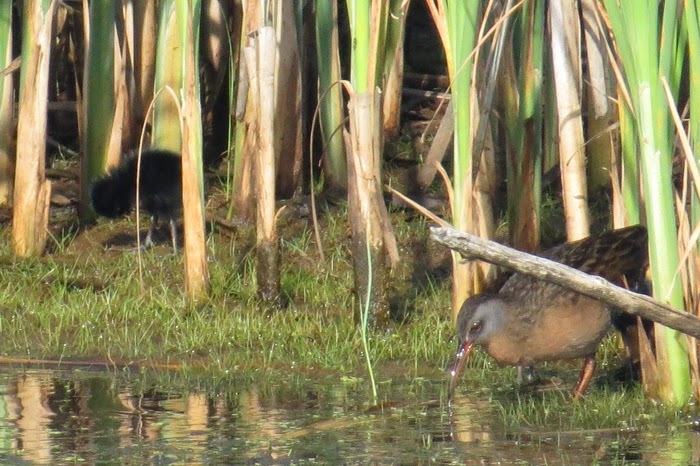 Birding is nothing if not full of surprises; this Virginia Rail appeared in The Meadows with no less than eight fluffy black chicks on last Monday's morning walk - note the little black chicklet left of center here [photo by Warren Cairo]. Well, the end of Cape Maygration may be getting close, but it seems that no-one told the birds! Though May will soon be done and June is just around the corner, the shorebird spectacular along the Delaware Bayshore shows little sign of abating and there's still plenty of time to come down and join one of our shorebird trips. This morning's Heislerville visit revealed that a good number of most shorebird species seem to have moved on northward, but the full range of regularly-occurring species was still present and Semipalmated Sandpipers presented the largest flocks I have seen so far this season. White-rumped Sandpipers seem still to be steadily increasing too, with at least nine enjoyed by our group in one small corner of the main Heislerville WMA impoundment. Not far away, the bayshore beaches told a similar tale, with heaving masses of shorebirds all stuffing themselves on horseshoecrab eggs and fattening up, ready to head north to the Arctic and another breeding season. Shore To Please!! A beach covered in a moving, wall to wall mass of Semipalmated Sandpipers is a real sight to behold - and the epitome of Cape Maygration at its very best [photo by Mike Crewe]. With so many Semipalmated Sandpipers in town right now, it can be difficult picking out something different - but this Red Knot stands out in the crowd [photo by Mike Crewe]. Fat and healthy looking Red Knots were flying right past our view point on this morning's walk - a sign that the Delaware Bay's fragile ecosystem is still hanging in there [photos by Mike Crewe]. Heislerville WMA is a good place for Clapper Rails right now, as breeding birds tend to newly-hatched chicks. The smaller impoundment at the westernmost end of Matt's Landing Road is often a good place to see this species (as it was today...) [photo by Mike Crewe]. And don't fall into the trap of ignoring common species - Laughing Gulls are abundant in New Jersey right now, but they are very impressive in their breeding finery and make for some exciting photography [photo by Mike Crewe]. Good shorebirding can still be had elsewhere too. This Wilson's Phalarope appeared at the impoundments at Higbee Dike on May 25th, among a fine selection of other shorebirds. Though I at first thought this rather bright individual was a female, closer examination of the photos revealed it to be a bright adult male. In flight shots, the primaries could be seen to be fresh and unworn - making it an adult - therefore, the lack of pale gray on the crown and rich maroon and pale gray coloring on the mantle would indicate that this is a male. Individuals vary widely in overall species and ageing and sexing phalaropes can be difficult at the best of times [photos by Mike Crewe]. Last chance until next year... Though warbler migration will be strong at Cape May in the fall, spring birds will always be the ones that put on the best firework display. Here's just a quick selection of fine birds that graced Cape May Point a few days ago - and reason enough to hurry back here as soon as you can! Top down: Chestnut-sided Warbler, Magnolia Warbler, Blackburnian Warbler [photos by Mike Crewe]. Location Abbreviations: Belleplain (Belleplain State Forest), CMP (town of Cape May Point), CMPSP (Cape May Pt. State Park), SCMM (South Cape May Meadows). It seems that most of the remaining Brant have vacated the Cape-- only 12 were seen during an aerial survey of Atlantic coast marshes between Wildwood and Ocean City 23 May (NJDFW). A male Common Eider surprised observers at CMP 23 May (BB, m. ob.). All three scoter species continued to linger around CMP through the week; a few hundred Black Scoters were still present in Delaware Bay between CMP and Reed's Beach (m. ob.). A White-winged Scoter was noted at Avalon 20 May (GDw). Red-throated Loons finally moved out this week, with an apparent last date of 19 May (m. ob.). The Red-necked Grebe remained at Champlain Drive in Villas through 23 May (BP). As is often the case, Brown Pelican has been rather scarce this month. A single was seen from CMP 23 May (AC). At least 6 Mississippi Kites could be found over CMP and West Cape May 17 May, with at least 10 seen 18 May (m. ob.). Sightings of at least one individual continued through the week. Swallow-tailed Kites also made an appearance this week, when two individuals passed through Cape Island during the afternoon hours 17 May (fide RM). At least 50 Broad-winged Hawks circled over CMP during northwest winds 18 May (m. ob.). Rare in spring, a male Wilson's Phalarope performed nicely at SCMM 20 May (TR, VE, m. ob.). A Stilt Sandpiper was also present there 19–21 May (m. ob.). White-rumped Sandpiper became a daily sight at SCMM through the week, with a max of 4 birds on 22 May (TB). A group of 5 appeared at High's Beach 23 May (WK). A couple lingering Wilson's Snipe were noted at West Cape May 17 May (RH, KH). Parasitic Jaeger became a bit less reliable this week, but was seen from CMP on several dates (m. ob.). Exceptional in spring, a Long-tailed Jaeger was carefully studied as it traveled north and west past CMP 18 May (VE). A Roseate Tern put in a brief appearance at Bunker Pond, CMPSP 19 May (MO'B, LZ, m. ob.). A Black Tern entertained observers at CMP 20 May (MP, m. ob. ), and at least two Lesser Black-backed Gulls remained on the CMP beachfront through the week (m. ob.). Numbers of Common Terns and Black Skimmers slowly increased, with 100 Commons and 40 Skimmers seen in the Hereford Inlet area 23 May (NJDFW). A Eurasian Collared-Dove, perhaps the same individual as previously noted, was seen along Seagrove Avenue, CMP 20 May (RC). At least three Black-billed Cuckoos could be found at CMPSP 19 May (m. ob.). A Pileated Woodpecker was briefly heard calling near Green Creek 20 May (SG). Another uncommon spring migrant, a Yellow-bellied Flycatcher was noted at West Cape May 23 May (MG et al.). Willow Flycatchers returned to known breeding areas, such as CMPSP and Corson's Inlet State Park this week (m. ob.). CMP's Black-capped Chickadee was last noted 17 May (m. ob.). A backyard in Avalon hosted a Gray-cheeked Thrush and a Canada Warbler 21 May (GDw). There have not been many reports of Kentucky Warbler this spring-- one was heard just north of "the bridge" at Belleplain 17 May (TJ). Notable migrant warblers included a Mourning Warbler near Green Creek 22 May (SG), 2 Bay-breasted Warblers at Belleplain 21 May (MO'B, LZ), Tennessee Warbler at Belleplain 18 May (MO'B, LZ), and multiple reports of Wilson's Warblers at Cape Island 19–22 May (m. ob.). Late Savannah Sparrows were noted at Belleplain 20 May (m. ob.) and at SCMM through at least 22 May (m. ob.). Tom Baxter (TB), Bill Boyle (BB), Alan Crawford (AC), Richard Crossley (RC), Gail Dwyer (GDw), Vince Elia (VE), Sam Galick (SG), Mark Garland (MG), Kathy Horn (KH), Roger Horn (RH), Tom Johnson (TJ), Will Kerling (WK), Robert Maurer (RM), NJDFW (New Jersey Division of Fish & Wildlife staff), Michael O'Brien (MO'B), Mike Pasquarello (MP), Beth Polvino (BP), Tom Reed (TR), Louise Zemaitis (LZ). eBird. 2012. eBird: An online database of bird distribution and abundance [web application]. eBird, Cornell Lab of Ornithology, Ithaca, New York. Accessed 23 May 2014. Available: http://www.ebird.org. As we pass imperceptibly into the second half of May, life becomes a little stressful for the dedicated Cape May birder. Why would this be? Well, impossible as it may seem, some of us are forced to venture over the canal bridge and head north to enjoy the region's best shorebird spectacular in - shock, horror - Cumberland County!! I am sure some are working away very hard behind the scenes to try to annex that little piece of land that lies east of the Maurice River and harbors the Heislerville Wildlife Management Area, for here is the spot that all self-respecting birders will want to be at during the second half of May. On the east bank of the Maurice River and at the west end of Matt's Landing Road, Heislerville WMA has a cluster of three, non-tidal impoundments and in the second half of May at every high tide, the central impoundment provides a roosting area for large numbers of shorebirds, pushed off their feeding grounds by the rising waters of the Delaware Bay. Not only does this area bristle with birdwatchers, it also bristles with researchers, for it is here that much of New Jersey Audubon's research into Semipalmated Sandpipers takes place - and the team will be more than happy to tell you about their work should you chance across them in their temporary work camp on the south side of the site. On a first visit, Heislerville can seem very daunting; in front of you will lie a sea of brown and white, a great seething mass of totally confusing birds and not everyone's cup of tea. So here's a quick guide to the key species that can be expected at Heislerville at this time of year - of course, you can always come on a CMBO walk or workshop and benefit from the experience of our wonderful team of leaders, who will help you to get to grips with this interesting group of birds... we currently run Heislerville walks on Tuesdays and Thursdays through May. Be sure to check the tide tables and aim to be at Heislerville around high tide, for it is then that birds are pushed off the intertidal flats and waves of birds (here mostly Dunlin and Short-billed Dowitchers) begin to arrive at the impoundment [photo by Mike Crewe]. As birds drop in to roost, we can begin to work through the flocks to see what has arrived. 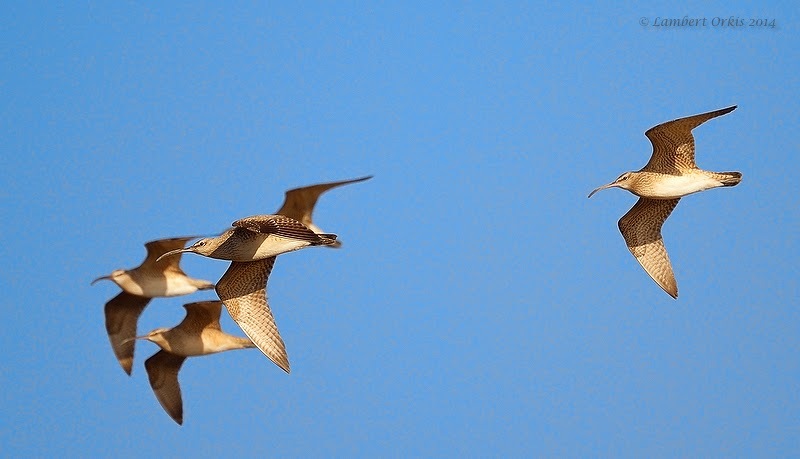 Here, a group of Semipalmated Sandpipers flies in [photo by Mike Crewe]. Once birds are on the ground, we can start to work through them - and the task may at first seem daunting! In this photo, seven species of shorebird share space on the beach at East Point, just around the corner from Heislerville [photo by Mike Crewe]. The commonest small 'peep' that you are likely to see at Heislerville in May is Semipalmated Sandpiper. This is overall a rather cold, gray-brown bird with just a touch of rust on the head. But with shorebirds, we should always look beyond the plumage and consider the structure; Semipalmateds are small, with short wings that just come to the tip of the tail. The bill can be confusing as the length varies - we can deduce that this bird is probably a male as the bill is particularly short. As this is the commonest species, we can consider it our yardstick, by which we can judge other species [photo by Mike Crewe]. Least Sandpipers are small, like Semipalmated Sandpipers but, at this time of year, are noticeably browner with rusty edges to the tertials (at the back of the wing). Most importantly, check the legs carefully and you will see that they are yellowish-green, not black. Least Sandpipers habitually feed on mud rather than in the water, even rooting around among the bases of plants growing around the edge of the impoundment [photo by Mike Crewe]. Stepping up a size, Dunlins are a little larger than the small 'peeps'. Dull gray-brown in winter, Dunlins really brighten up in breeding plumage and can be easily identified by their black belly patches and rich, rufous-brown backs. Note the relatively long, black and down-curved bill [photo by Mike Crewe]. While scanning through the Dunlins, look for a similar-sized bird with more subdued colors and a shorter bill that has a pale base. Note also the finely and very neatly-marked breast. If you are lucky, the bird might stretch a wing and you will see its white rump - this is a White-rumped Sandpiper. White-rumps are not common at Heislerville, but small numbers pass through in late May and should always be looked for at this time [photo by Mike Crewe]. Largest of the commoner shorebirds to be found around Heislerville's muddy margins are the Short-billed Dowitchers. Though they always look rather dark overall at this time of year, this is a rather variable species, with males being more richly colored than females, and adults more richly colored than first-summer birds. Except for the dark brown back and tints of cinnamon below, it's best to leave plumage details in favor of structure to tell this bird from the other species present. Short-billed Dowitchers have olive-colored legs, long, black bills (despite the name) and are heavy-bodied. The very similar Long-billed Dowitcher may occur on occasion at Heislerville (perhaps one or two among the thousands of other shorebirds) but the vast majority of dowitchers here will be Short-billeds [photo by Mike Crewe]. ...this bird is a Willet, yet it looks very unlike the bird above. This is a Western Willet and - rumor has it - the two forms may one day be considered separate species, so it's always good to get an eye in on them. Despite the name, Western Willets regularly pass down the East coast in fall, but May birds are decidedly unusual. Note the longer and slimmer bill compared with the Eastern Willet, the overall 'longer' look of the bird and the paler plumage [photos by Mike Crewe]. But it's not all doom and gloom for Cape May Pointers! The South Cape May Meadows continue to be managed well for migratory shorebirds and today attracted a Wilson's Phalarope (seen here on the left, with a Greater Yellowlegs on the right). Phalaropes habitually swim, which can be a useful identification guide, though Wilson's swims less than other phalarope species [photo by Mike Crewe]. I came across this flag-marked Ruddy Turnstone in my photos from East Point Lighthouse that I took on May 19th. 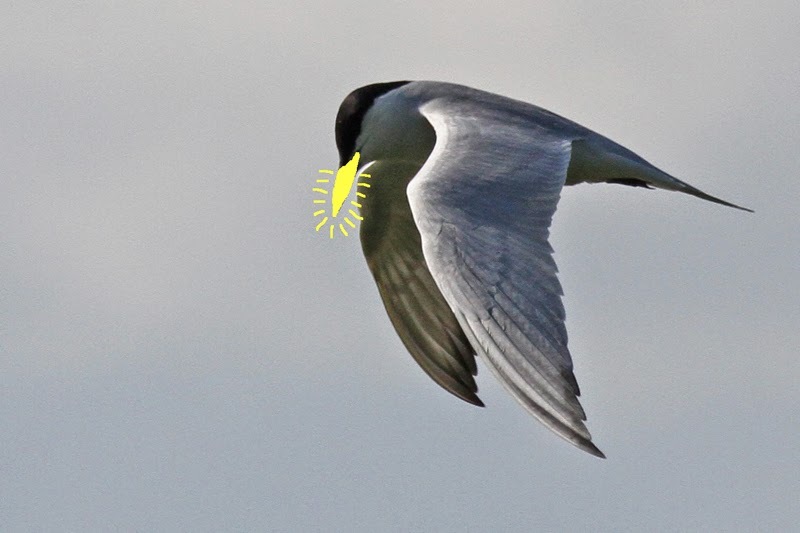 The code 8HU can easily be read on this bird and serves as an unique identifier for researchers to be able to track the bird's movements - but tracking relies on birders to report their finds [photo by Mike Crewe]. Location Abbreviations: CMP (town of Cape May Point), CMPSP (Cape May Pt. State Park), SCMM (South Cape May Meadows). Most lingering waterfowl finally pulled out of the area during the last two weeks. Determining "last dates" can be a difficult task, but the following is the most complete information available. Northern Shoveler was last reported at SCMM 4 May, Eurasian Wigeon at CMPSP 7 May (very late), and Ameican Wigeon at CMP 11 May (m. ob.). Blue-winged Teal was last noted at Cove Pool 12 May, while Green-winged Teal was last seen at SCMM 16 May (m. ob.). As for diving ducks, Ring-necked Duck put in its final appearance at CMP 4 May, while all three scoter species could still be found at CMP 16 May (m. ob. ), along with 100s of Black Scoters still present in Delaware Bay north to Reed's Beach. Bufflehead was last reported from the Jarvis Sound area 6 May (VE), Long-tailed Duck remained at Jarvis Sound through 12 May, and small numbers of Red-breasted Mergansers can still be found in the Atlantic back-bays and along the Delaware Bay (m. ob.). A rather late Common Goldeneye was observed offshore CMP 10 May, and a random Common Eider appeared there the same day (m. ob.). A Red-necked Grebe stayed put at Champlain Drive, Villas through at least 15 May (m. ob.). A late imm. Great Cormorant stopped at Reed's Beach 7 May (TR, JM). Least Bittern is an increasingly scarce spring migrant on Cape Island-- one was at CMPSP 6 May (VE). An additional two were heard along Tyler Road, a traditional breeding location, 10 May (TR et al.). Multiple Cattle Egrets continued to be seen along Route 9 in Swainton throughout the period (m. ob.). 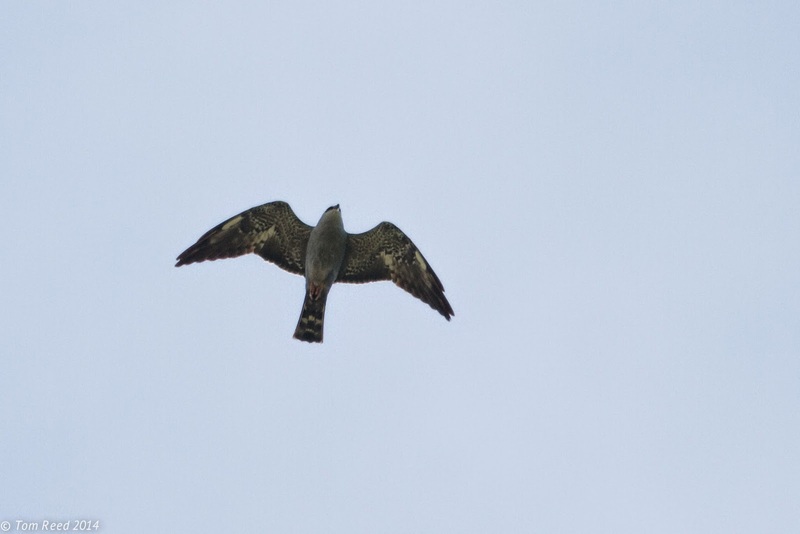 The season's first Mississippi Kite, an adult, was seen over the Beanery 8 May (TR, KK, JM). A minimum of 10 were tallied over West Cape May 11 May, and these were also briefly joined by a Swallow-tailed Kite (m. ob.). The same or another Swallow-tailed Kite was seen over CMP 12 May (RB). Northern Harriers have been a regular sight at Jake's Landing (m. ob.). As many as 75 Broad-winged Hawks were seen over CMP 6 May, a strong spring total (m. ob.). King Rails were heard along Tyler Road on multiple nights (m. ob.). Difficult to find in spring, a Common Gallinule made for a fun discovery at Cox Hall Creek WMA 11 May (TM). One of Cape May birders' most desired springtime birds, a Black-necked Stilt explored the ponds at CMPSP and SCMM 15 May (m. ob.). Nummy Island hosted a Marbled Godwit 4 May (BQ, NS). Numbers of "beach-pipers" increased along Delaware Bay through the period. White-rumped and Stilt Sandpipers were seen on multiple days at SCMM and Cove Pool, most recently on 16 May (m. ob.). The "rips" offshore CMP continued to hold multiple Parasitic Jaegers. Royal Tern was seen on several dates, and Gull-billed Terns have been regular at Beaver Swamp WMA (m. ob.). A Black Tern was seen from CMP 12 May (GD), and a Roseate Tern made a brief appearance on the beach at CMPSP 16 May (TR et al.). CMP's last remaining Eurasian Collared-Dove was still present as of 10 May (m. ob.). A, or the, Pileated Woodpecker was seen at CMPSP 9 May (MP). A tardy Yellow-bellied Sapsucker was well-photographed at CMP 9 May (MC et al.). An exciting find was the Crested Caracara over the Beanery/Rea Farm 4 May (Brian McMahon). It was seen again 5 May (m. ob.). Out-of-range Caracaras were also noted in Wisconsin and Virginia during the period. CMP's Black-capped Chickadee remained through the period (m. ob.). A Scissor-tailed Flycatcher made an all-too-brief appearance on the beach at CMPSP 14 May (MG et al.). It was last seen flying high to the northwest. A Bicknell's Thrush played hide-and-seek with birders at the Higbee Beach WMA parking lot 11–15 May (DF, m. ob.). Orange-crowned Warbler is a rare spring migrant, therefore one at CMP 9 May was noteworthy (TJ). Rare in general, a Cerulean Warbler was also a highlight at CMP 5–6 May (m. ob.). A Grasshopper Sparrow was at the Beanery/Rea Farm 7 May (MP). A singing Clay-colored Sparrow was out of place at Higbee Beach WMA 12 May (HT, m. ob.). Higbee also played host to a bizarre Yellow-headed Blackbird 9 May (MC, m. ob.). Late Purple Finches were detected at CMP 9 May (m. ob.) and at WCM 11 May (MO'B). Robert Bowker (RB), Mike Crewe (MC), Glen Davis (GD), Vince Elia (VE), Don Freiday (DF), Mark Garland (MG), Tom Johnson (TJ), Kevin Karlson (KK), Brian McMahon (BM), Tom McParland (TM), Jonathan Meyrav (JM), Michael O'Brien (MO'B), Mike Pasquarello (MP), Brian Quindlen (BQ), Tom Reed (TR), Nathaniel Sharp (NS), Harvey Tomlinson (HT). eBird. 2012. eBird: An online database of bird distribution and abundance [web application]. eBird, Cornell Lab of Ornithology, Ithaca, New York. Accessed 2 May 2014. Available: http://www.ebird.org. As songbird migration begins to wind down a little (though rest assured, there will be plenty more birds winging our way over the coming weeks), our focus at Cape May switches from fields and woods to muddy shores and open water. Everything in turn has its day and we are now seeing a great build up of shorebirds in the back bays and along the Delaware shore. It's time to start thinking about CMBO boat trips, horseshoe crab expeditions to the beaches with the Nature Center of Cape May and - of course - all the fun of Cape Maygration! There's something missing here, can't quite place what it is... oh yes, the top of the Cape May lighthouse was shrouded in mist today [photo by Mike Crewe]. Right on cue, flocks of Short-billed Dowitchers wheeled around the muddy pools at TNC's South Cape May Meadows today. For a real shorebird extravaganza, don't miss our twice-a-week visits to Heislerville this month [photo by Mike Crewe]. New Jersey is one of the smallest states in the union and yet the sheer variety of birds here during migration periods is truly remarkable and the World Series of Birding certainly highlights that fact. Our hats go off to the overall winners, the Cornell Redheads, sponsored by Cornell, who notched up an impressive 218 species on a route that took in the whole state. Closer to home, CMBO's Century Run total was well beaten by Swarovski SPNI Champions of the Flyway - a team made up of local tour de force Tom Reed and a group of very savvy birders from Israel. These guys managed an awesome 178 in Cape May County alone - the same area that we were restricted to. But, while big lists equal more money for conservation, it is fair to say that most people take part for the fun of it and - for me at least - one of the real highlights of the event is not the day itself, but the trials and tribulations that are shared at the brunch the next day. Tales of missed opportunities, birds that didn't show and all manner of minor knocks and scrapes are fun to share, but an added element (and increasingly so these days) is the stream of stories that trot out from the youth teams. There can be no doubt that encouraging the next generation to get outside and enjoy birds is a healthy step in the right direction and sponsorship and support for youth teams from the likes of Carl Zeiss Optics, Cornell Lab, Cape May-Lewes Ferry and a number of youth centers and bird clubs is leading the way. Overall, 255 species of birds were notched up collectively in the state of New Jersey on May 10th - a remarkable total and one which is only a handful of species short of what it has taken me all year to reach so far! Looking down the cumulative list for all teams is always interesting and - perhaps not surprisingly - the most obvious thing that stands out this year is the unusually high number of species normally considered to be winter visitors here. Such species are usually missed on World Series day or, at very best, are only seen by a handful of teams, but it is telling that this year all the loons and grebes were easily seen by most teams, all of the waterfowl but three were notched up and all of the sparrows bar one fell to sharp eyes on the day. In addition, a look at the species that were added as 'write-ins' to the list shows that this year's batch - Red-necked Grebe, Tundra Swan, Rusty Blackbird and Common Eider - would all normally be considered winter visitors. And after the prolonged winter and cold spring that we experienced in the eastern USA this year, it's not surprising that such species were readily found - it's only a shame, perhaps, that someone couldn't pull out a Snowy Owl; now that would have been a top find in May! Although World Series Day indicates that spring is well and truly pushing us headlong into summer, it is certainly not the case that spring migration is over. Damp and dreary weather today may have slowed down the migration train, but Mark Garland still pulled the 'big one' out of the hat today by finding a Scissor-tailed Flycatcher on the South Cape May Beach and we still have the full exuberance of the horseshoe crab season to come. Events throughout this month form part of our Cape Maygration season and there will be many more days of exciting birding down here in South Jersey over the coming weeks. As a tempter to get you here to enjoy the fun (as if you haven't already booked!) here's a few pictures from World Series day and from a few days either side - the birds are here, it's time to start enjoying them! Having moved offices recently (I always work on the premise that a moving target is harder to hit!) I find myself starting a new 'office window list'. Though I can't now see the busy Northwood Center feeders, I do have a more commanding view of the property and this Red-headed Woodpecker was a welcome addition to the ever-growing list (currently on 97 folks!) [photo by Mike Crewe]. Cape May has increasingly less open space as abandoned farmland continues to disappear unchecked under new housing (funny, I thought we already had a water shortage in Cape May!!) and birds such as Blue Grosbeak are becoming ever more localized in our area. However, CMBO's walk participants have been enjoying some fabulous views of this gorgeous bird lately [photo by Mike Crewe]. Now and again you find a bird that doesn't immediately jump out at you from the pages of your field guide and, more often than not, this can be down to constraints of space in the book. Singing birds tend to catch the attention more easily and a peculiar bird at this time of year may well be a first-year male from one of a number of species where such individuals don't acquire their full breeding plumage. This odd looking bird is a first-summer male Orchard Oriole, one of several that can currently be seen well at degraded or only semi-natural habitats such as Cape May Point State Park and Higbee Beach [photo by Mike Crewe]. On any day in May it is worth being out in the field as things are changing almost by the hour. 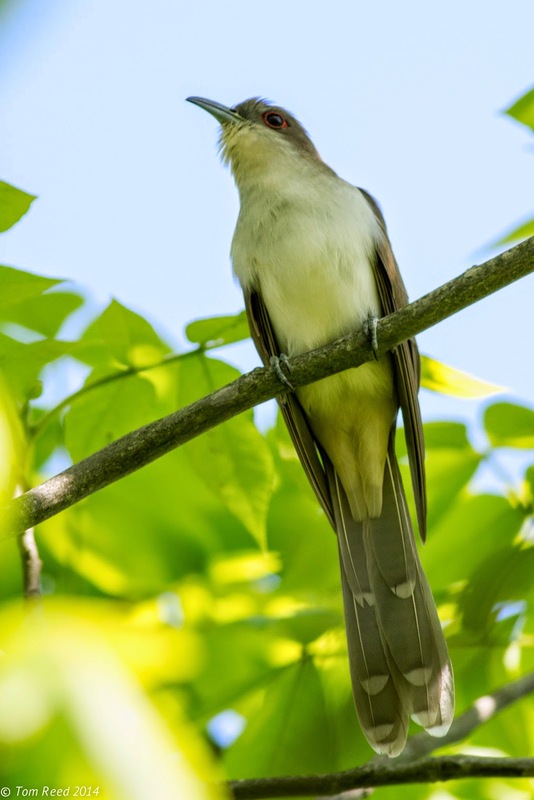 After feeling we had cleaned up pretty well in Cape May County on World Series day, less than an hour at Higbee Beach first thing the next morning provided us with no less than 10 species that we had not found the day before - including this Black-billed Cuckoo [photo by Mike Crewe]. Meanwhile, back at the office window! Male Yellow Warblers certainly live up to their name at this time of year and good numbers can currently be enjoyed around Cape May [photo by Mike Crewe]. It's not over until it's over... the warbler festival will continue for a while yet, with birds such as this Chestnut-sided Warbler appearing over the last couple of days around Cape May Point [photo by Mike Crewe]. Patience really can be a virtue... Canada Warbler is up there in the top five for me when it comes to American wood-warblers, but I've never been able to manage a decent shot of this species, which spends a lot of time skulking in thick cover. Luck came my way at Higbee Beach on Sunday morning, however, when this bird posed beautifully in a quiet corner for me. Note - no bird call app, no feeder, no water drip - just field craft :-) [photo by Mike Crewe]. As we progress through Welcome Week for teams out scouting for the 31st World Series of Birding, Cape May's birds are rising to the challenge and lining up to be counted (though you can bet that some of them will be little tinkers and will disappear come Friday night!!). Variable but generally mild weather conditions with light winds are encouraging a steady flow of birds through the area and things are looking great for a fun day on Saturday. Though it is too late to get yourself involved in a team for this year (though you can of course pledge on a team via the World Series of Birding pledge page on our website), there is still a great opportunity for you to take part in Enjoy The Birds Day and let us know what birds you are seeing - and post your photos of them too! Click on Enjoy The Birds Day here to go straight to the page that will give all the information you will need to be part of a spectacular day to be enjoying birds. As a warm up to the weekend, here's some of this week's tempters to get you either out in the field, or watching for goodies in your own backyard!! Early May sees the return of all of our wonderful breeding birds, whether you be heading for the woods, the meadows, the bay or the shore this weekend. This first-year male Summer Tanager graced the Northwood Center this week and this fabulous species is likely to be singing in woods near you right now [photo by Brian Moscatello]. With the arrival of May, come the shorebirds. 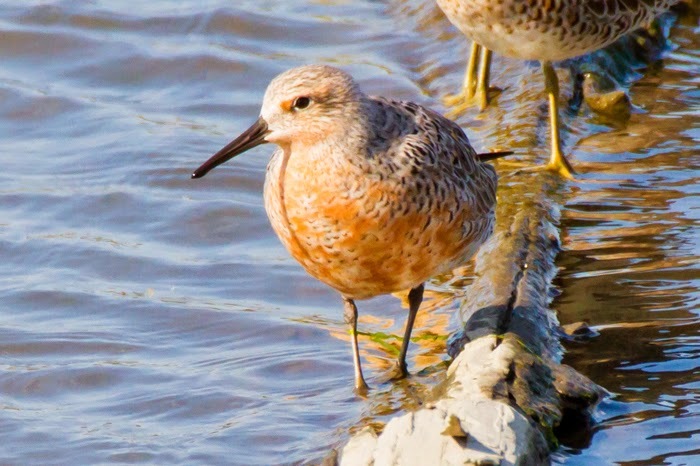 The peak of activity will not be for another 10 days or so, but there's plenty of snazzy, breeding-plumaged birds along the coast and bayshore to be enjoyed right now - such as this smart Red Knot which was at Heislerville WMA during our walk there on Tuesday afternoon [photo by Arthur Steinberger]. ....or Bonaparte's Gull - here, just a few of the 109 that we counted at East Point Lighthouse in Cumberland County on Tuesday afternoon [photos by Mike Crewe]. And of course there are always the unexpected little surprises that pop out of the foliage when you are least expecting them. This male Cerulean Warbler was first located in the Gray Poplars right outside the Northwood Center on Monday evening and remained throughout Tuesday [photo by Mike Crewe]. For those of you settling on some birding from your own backyard, there will always be pleasant surprises! This male Wild Turkey has settled into the area around the north end of Lake Lily and has been a welcome addition to the local birdlife lately - let's hope he stays at least through the weekend [photo by Mike Crewe].